Guy Ritchie is certainly not known for making movies with real substance, and King Arthur: Legend of the Sword continues in this vein. Flashy and CGI’d within an inch of its life, King Arthur is a fun watch that foregoes emotional substance for jacked up fight scenes and overly-witty dialogue. 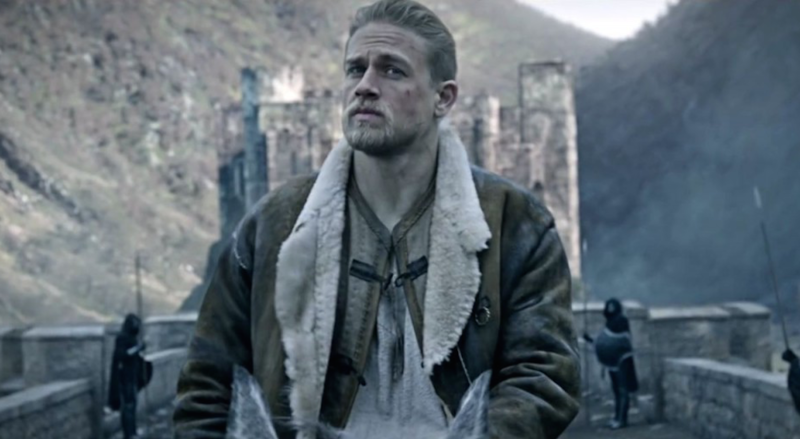 In this telling of the famous story of Camelot, Arthur (Charlie Hunnam) is an orphaned outcast, raised in a brothel after his uncle Vortigern (Jude Law) murdered his parents, the king and queen, to take over the kingdom for himself. Vortigern is a powerful mage who rules with fear and intimidation. But as his power grows, so do the forces against him. Once Arthur pulls Excaliber from the rock, it’s a race against time until nephew must battle uncle to determine who is the real king. Plot-wise, it’s pretty much exactly what you expect. We all know the story of Arthur and Camelot and the knights of the round table. Ritchie is much less concerned with plot and much more concerned with how the film is styled. In many ways, King Arthur reminds me of A Knight’s Tale (2001). In that film, directed by Brian Helgeland and starring a young Heath Ledger, all sense of accuracy was thrown out the window as the film gleefully showed audiences a classical medieval story couched in the cultural references and songs of the modern day. In it’s sheer joy at abandoning the shackles of historical accuracy, A Knight’s Tale become a thoroughly enjoyable, fluffy watch. In King Arthur, Ritchie seems to torn between being witty or funding crazy special-effected scenes. His Arthur is sarcastic and wry, constantly prattling off funny dialogue at such breakneck speed (with breakneck cutaways) that it’s difficult to keep up let alone catch all the jokes. It makes for a lightness that balances the very serious, very sword-y action scenes. The scenes move so fast that it’s difficult to keep up. Even worse, many of the battle scenes are CGI’d to excess, to the point where I couldn’t decide if I was watching a film or just a bunch of video game actors duking it out. Rather than add to the story, it all just feels flashy, like someone gave Ritchie way too much money to play with. The director needs to return to a film style like the wonderfully entertaining The Man From U.N.C.L.E., which openly emphasized style and fashion over super compelling plotlines. King Arthur isn’t a bad film. There’s still plenty to laugh and cheer about. Its big fight scenes, where you watch two digitally created actors duke it out, could’ve done with more heart and less money. With a ending that keeps the idea of a sequel open, I would be shocked if this didn’t have a follow-up in the next couple of years.